With their 30-year-old master bath in desperate need of an update, these homeowners turned to Elizabeth Kavlok, Dashing Design, to bring the 116-square-foot space into the modern world. First on the agenda was relocating the toilet and bidet, which were both seen from the entrance to the bath. By mirroring their location, the toilet and bidet are now out of sight from most any angle when viewing the bath and are in their own roomy, private niche. The homeowners also chose to remove the tub, as other bathrooms in the home have the option of a tub. The focus then turned to the shower. 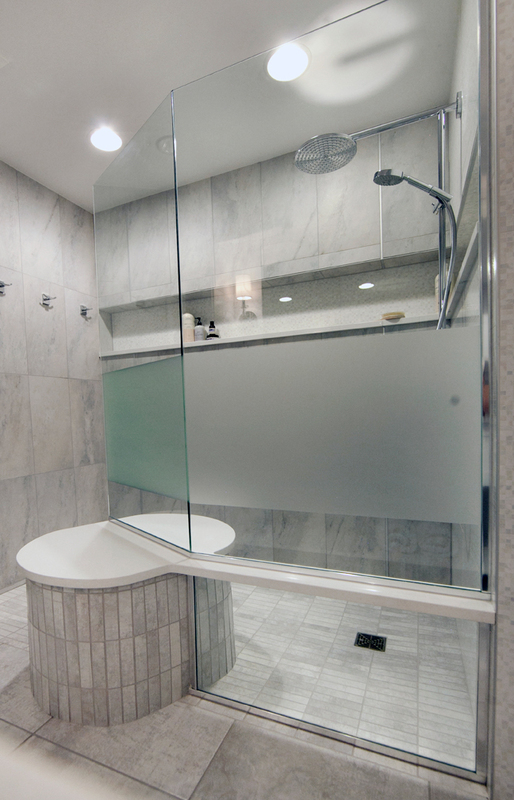 The open shower is surrounded by glass with sandblasted panels for tasteful privacy. Entry into the shower is easy with zero transition, and hooks for towels and robes make it practical. Metal strips jazz up the length of the shower, while a mother-of-pearl decorative tile adds interest on the plumbing wall and continues into the shower niche. The oval shower seat drove the all-around design of the master bath. Because the tub was removed, Kavlok needed to come up with a replacement seating area for her client to sit and brush her teeth in the morning. The multifunctional seat extends into the shower area. The seat’s design defies much of the rest of the bath’s design by introducing a completely curved element to the otherwise straight-line driven design. The vanity counsel is the ultimate his-and-hers setup. Each has their own large and tall linen cabinet with a pull-out hamper. 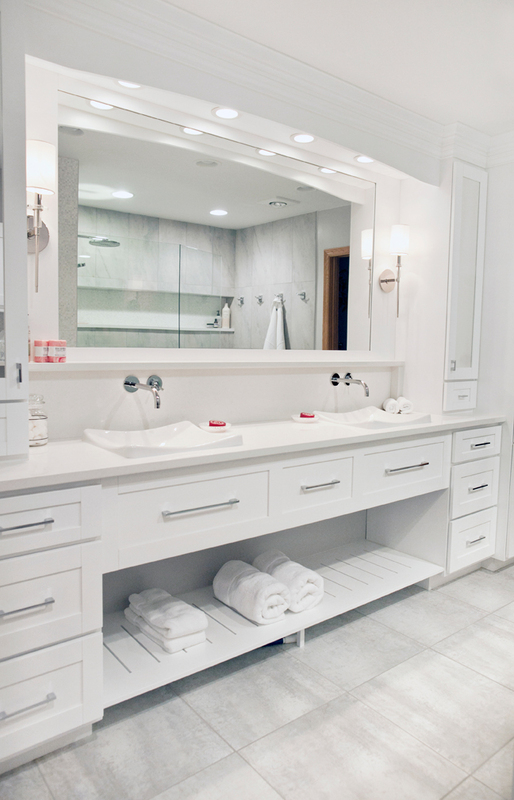 A light, airy feel was achieved with the built-in vanity counsel by opening up the area below the Kohler sinks. Tones of white and gray give this functional and attractive master bath a bright, clean and simple look. This master bath was extremely well thought out. The shower seat is outstanding. While the majority of the space is very linear, the little bit of round in the seat brings in a nice contrast.